Line the base of the tins with baking parchment paper or greased greaseproof paper. Heat the oven to Gas 4 / 180C. Melt the chocolate in a bowl over a pan of hot water then leave to cool whilst making the cake. Cream together the fat and sugar until very light, beat in the eggs a little at a time, followed by the melted chocolate and vanilla. Carefully fold in the sieved flour; it will be a soft dropping consistency. Bake for approximately 25 minutes or until golden brown and firm to a fingertip touch. Remove onto a cooling rack. Filling: melt 50g (2oz) of the white chocolate. Cream together the butter and icing sugar and beat in the melted chocolate. Reserve 4 strawberries for decoration. Mash the remaining strawberries with a fork, not too small. Mix into just over half the butter icing and sandwich the cakes together. Spread the remaining butter icing on top. Grate the remaining 25g (1oz) chocolate and sprinkle on the top. Cut the strawberries in half lengthways without removing the green. Arrange on top of the cake, cut side up. 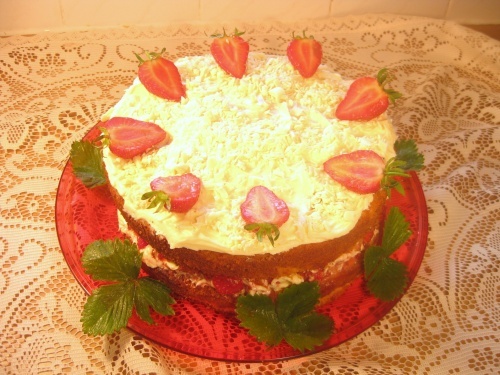 Tip: for a very light sponge I use McDougall’s Supreme Sponge Flour.